Everyone has their own routine for working out. While some people like to take supplements, others like to hop on the treadmill and run. According to multiple studies, listening to music in the gym is a way to not only stay focused, but take away the pain as well. The only true gym necessity is a pair of headphones. Everyone differs in their approach to working out: for some, cardio is the focus while others like to try and bulk up and body build. Many just like to stay as active as possible. Planning a trip to the gym seems simple – water bottle, sneakers and motivation. But for all gym-goers, there is just one true essential: headphones. Studies demonstrate the effects of music on motivation and pain tolerance. Dr. Daniel Levitin, a neuroscientist and author of This Is Your Brain On Music, told the Huffington Post in music is a distractor and a mood enhancer. In Scientific American, Ferris Jabr’s article “Let’s Get Physical: The Psychology of Workout Music,” states music can create an entire different reality, separate from the pain of the workout. Nowadays, it’s so easy to make a playlist and take it to the gym. Apps like Spotify and Pandora even have workout playlists pre-loaded onto their homepages. Kristen Condosta, a senior communication major, said she feels like headphones aren’t really necessary, per se, but notices a better quality workout when she remembers to bring them. From a psychology standpoint, the chemicals being released in the brain are altered when music is thrown into the mix. Apart from adrenaline, which is naturally released when someone works out, music can heighten dopamine, a feel-good chemical in the brain. Kenneth DeMarree, assistant professor of psychology, said music could definitely affect people’s mood and energy level. Getting down to the nitty-gritty, song choice can also play a huge difference in motivation and heightening energy. Kwame Lambert and Sean Knickerson, freshmen computer science and finance majors, respectively, said they wouldn’t be able to hit the weights without their headphones in. They both prefer to listen to rap. Lambert and Knickerson are two of many students who can attest to the power of music in the gym. 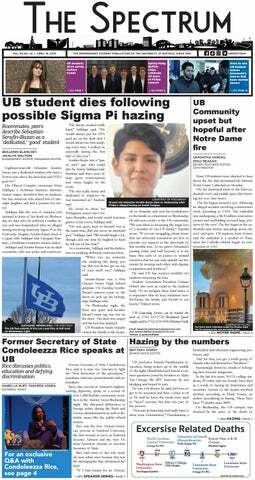 Brian Windschitl is the senior arts editor and can be reached at brian.windschitl@ubspectrum.com. Follow him on Twitter at @_brnwnd.